Harold Reed, left, and Jamie Lee Allen, right, hold signs to protest DHS outside of City Hall, in Philadelphia, February 12, 2019. Parents and child-welfare advocates called on the city’s Department of Human Services on Tuesday to reconsider how child abuse is reported and investigated to avoid unnecessary removals in an already oversized foster-care system. City Councilman David Oh introduced a resolution in September calling for more-objective guidelines for when child abuse is reported to the agency. Oh was investigated by DHS for injuring his son during a morning martial arts lesson at home last summer. Councilman David Oh speaks during a hearing about DHS at City Hall, in Philadelphia, February 12, 2019. The legitimacy of the resolution was immediately questioned at the hearing by DHS Commissioner Cynthia Figueroa, who said guidelines for reporting abuse are sufficient and are set at the state level, meaning the city has no authority to alter them. Oh accidentally broke his 8-year-old son’s collar bone while demonstrating a martial arts throw. A social worker at Children’s Hospital of Philadelphia called DHS, which investigated the incident and found no wrongdoing. But Oh said the “peek behind the curtain” left him disturbed by what seemed to be overly broad and subjective guidelines for mandated child-abuse reporters. He said he’s heard from constituents who believed their children were wrongly taken from them and feared that a high number of unnecessary investigations could be causing unneeded removals. State law provides a detailed definition of child abuse and who is required to report it, but does not define “reasonable suspicion,” the threshold mandated reporters are to use to report suspected abuse. The city received more than 19,000 reports of suspected abuse or neglect last year. DHS Deputy Commissioner Kimberly Ali, front left, and DHS Commissioner Cynthia Figueroa, front right, at a City Council hearing on child abuse reporting requirements February 12, 2019. Oh asked Deputy DHS Commissioner Kimberly Ali to define “reasonable suspicion.” He presented a scenario in which a boy breaks a toe playing basketball in a crowded gym and is brought to the hospital by his father. “Is that reasonable suspicion of abuse?” Oh asked. Ali said mandated reporters are not charged with determining whether an investigation is warranted but with presenting evidence to trained DHS hotline workers, who decide whether to take the case further. Figueroa said the department has only removed about 3 percent of children out of more than 12,000 investigations conducted in 2018. But the harm of one unnecessary investigation can be great, said Christine Gottlieb, co-director of the New York University School of Law Family Defense Clinic. “It’s invasive, it’s intimidating, and it can be extremely stressful, not only for the parents but the children," she said. Over three hours, the hearing turned into a more general airing of grievances about DHS, which has among the largest share of children in foster care, relative to its population, of any U.S. city. More than 37 people signed up to testify, most of them mothers, who rallied outside in the freezing rain before the hearing began. Parents who had gone through the process of having their kids removed said they were not given opportunities to defend themselves in court. Miltreda Kress said her daughters were taken after an allegation of abuse in the home. She said that her teenage daughter eventually ran away from a foster home, and that social workers do not know where she is. 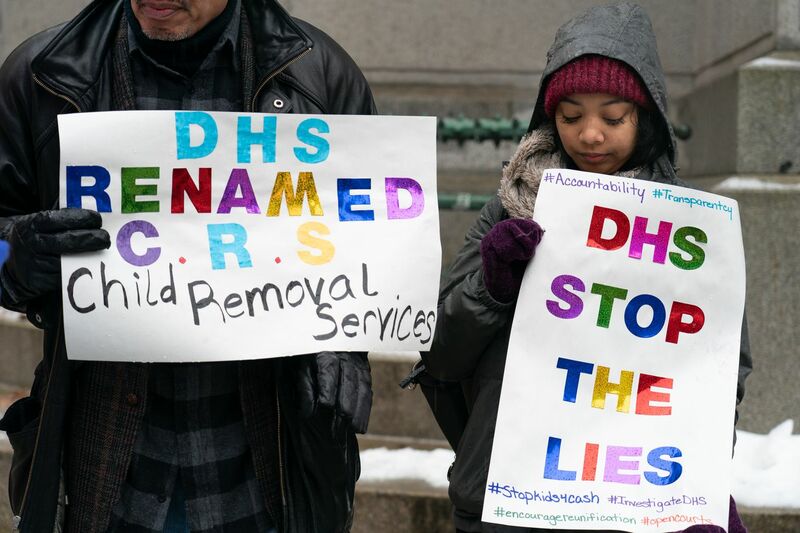 Vanessa Leary, protesting her treatment by DHS, hold signs and photographs of her children who are currently in the care of DHS, February 12, 2019. Lisa Mothee said she was investigated after her infant daughter tested positive for opioids, an issue she said her doctors knew about. She said she thought her medical records would clear her of wrongdoing, but said DHS workers mischaracterized her history. She eventually lost her children for issues related to medical neglect. It took eight months to get them back. The union representing DHS supervisors and investigators, AFSCME District Council 47, presented testimony defending the agency and the investigation process, which includes several layers of screening before a child is removed. Pamela Robinson, president of the union, who started her career as a DHS supervisor, said to jeers from the parents that DHS’s primary goal is always to keep kids with their families.